The idea of co-working spaces has been around for a long time now – earlier this year New York-based WeWork announced its plans to enter India, and there are plenty of Indian co-working spaces in different cities already. Some popular ones include Jaaga and BHive in Bengaluru, 91springboard and The Studio in Delhi, and Coworking Chennai. These spaces are great for startups looking to save money on rent, small businesses that need a meeting room once in a while, or even freelancers who don’t want to invest too heavily on office infrastructure for the home – after all, if you’re working from home you’ll probably have to spend money on power backup and might even have to spend extra on the Internet just to get a connection that’s both fast and reliable. The problem becomes finding a good space that can work as your office. Enter Awfis. 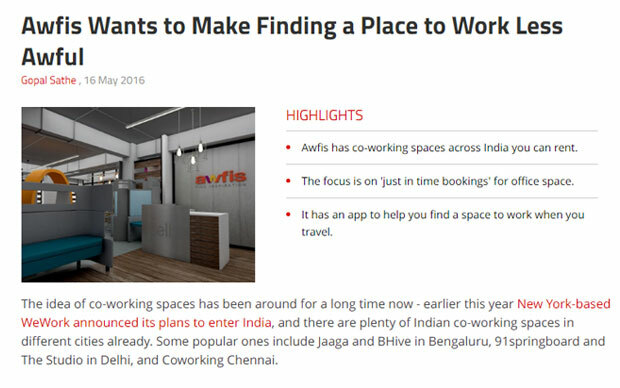 Founder and CEO Amit Ramani describes Awfis as “Uber for co-working”, and at first glance it does look like that – there are Awfis locations in Delhi, Mumbai, and Bengaluru already, with new locations planned for Hyderabad, Pune, Chennai, and Calcutta, and to book a seat or a meeting room, you need only use the Awfis app – and you don’t need to book in advance either; the company believes in the just in time model. In the app, you’ll also see that providers include meeting rooms from hotels, making this seem even more like an aggregator like Uber. But actually, that’s where the similarities end. The workspaces that are listed on the app belong to Awfis itself, and a percentage of the meeting rooms do too, with only part of the meeting room inventory coming from hotels. The company, which claims to have raised $10 million in funding (around Rs. 66 crores), will be using this money to expand, and according to Ramani, the goal is to have 10,000 seats, up from the existing 2,500, by December 2016.